A picture-perfect scene from the Grand View Point in the Island of the Sky district. 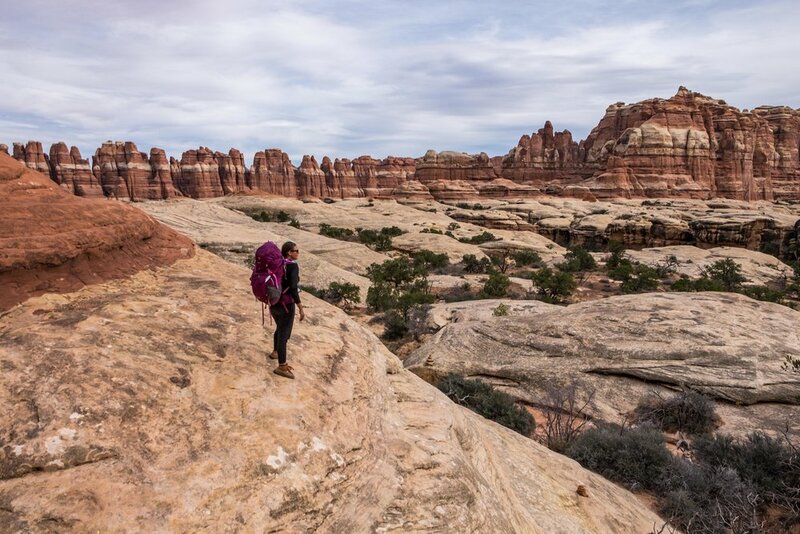 With 527 miles of wild landscape to explore in Utah's Canyonlands National Park, it can be tough to know where to start an adventure there. The Green and Colorado Rivers help to do some of the narrowing down for you by trisecting the park into three separate areas; while the lack of development narrows it down even further by providing only a couple of roads into the park boundaries. Such paved access ways open a door to the red rock wilderness, where the scenery is forever dressed by colorful Southwest sunsets that give way to soft dusky skies and brilliant starry nights night after night... it is very much a place to write home about. 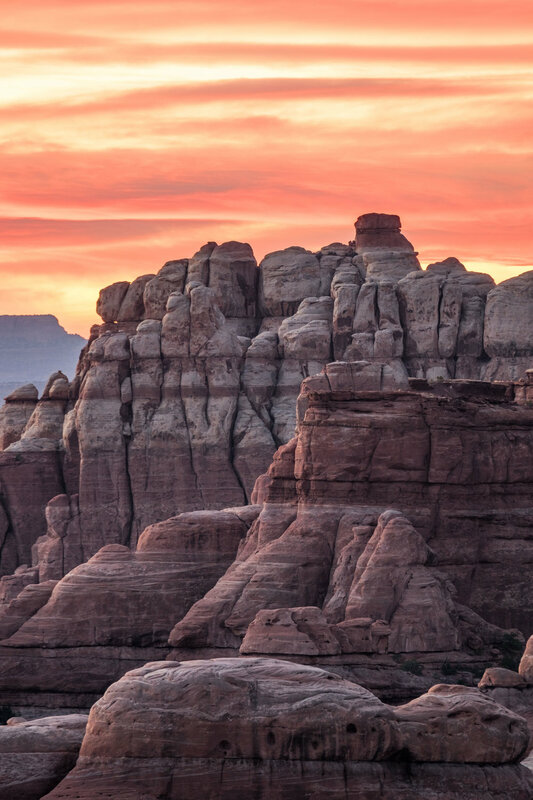 The Island of the Sky area is the closest of the three districts to the growing desert town of Moab which serves as a jumping off point into Canyonlands, as well as to neighboring Arches National Park and the La Sal Mountains. Island of the Sky is the place to get your 101 briefing of the area, while driving the paved park loop road aside the canyons on the high mesa provides easy access to stops along the road at archeological sites, as well as at trailheads that lead to easy-to-moderate hiking trails into your own private wilderness. In the evening, scenic viewpoints welcome visitors to cap off a day of exploration with the magic of sunset skies. This popular area is not only ideal for day trippers, but it is also heaven for mountain bikers and off-roaders who want to take 4WDrive vehicles onto the legendary 100-mile White Rim Road which provides an up-close and personal meeting with the interior canyons. The Grand View Point in the Island of the Sky district presents a spectacular view of a red rock wilderness carved by the Green and Colorado Rivers. 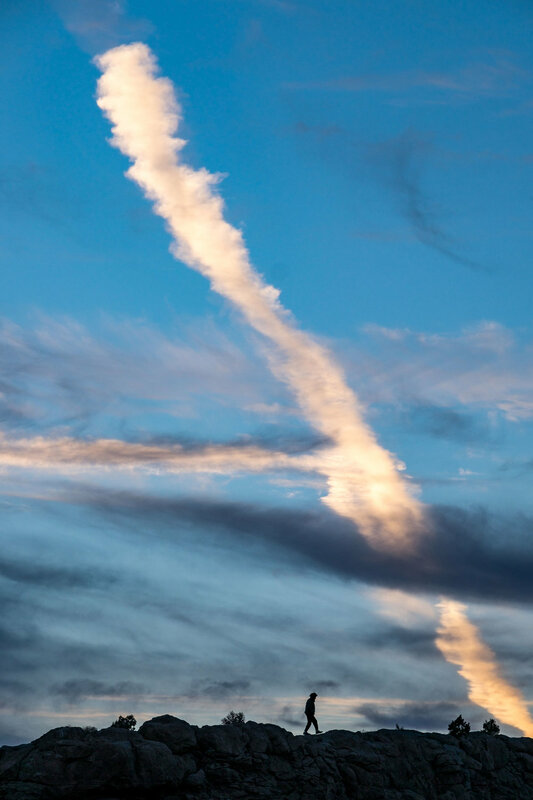 Needle formations rise into the sky during sunset in Chesler Park. 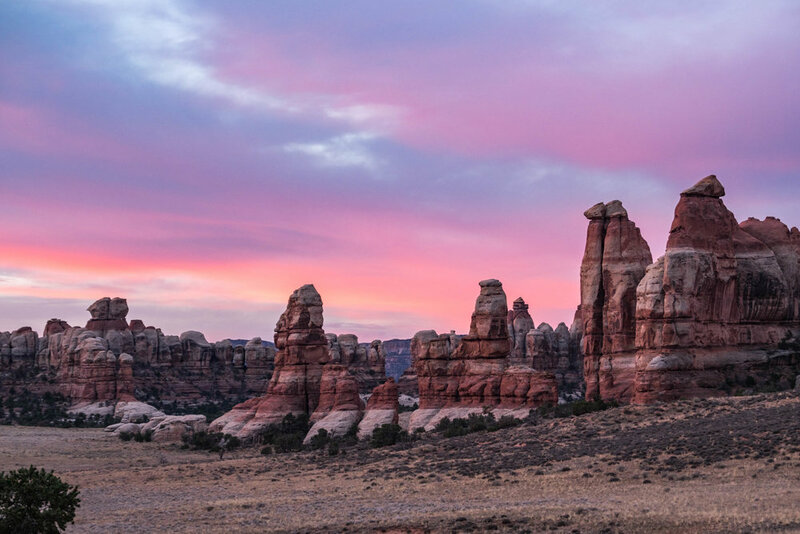 In the Needles district located southeast of Island of the Sky, adventurers get an even more personal meeting as there are more than 100 hikes leading into backcountry areas where the landscape turns itself inside out to present sandstone spires that rise into the sky. Pothole Point, Cave Springs, and the Chesler Park Loop trails are some of the most popular, but you'll likely find after consulting a map and with expert rangers at the visitor center that there are plenty of creative ways to chart your own adventure while flexing your outdoor survival skills. 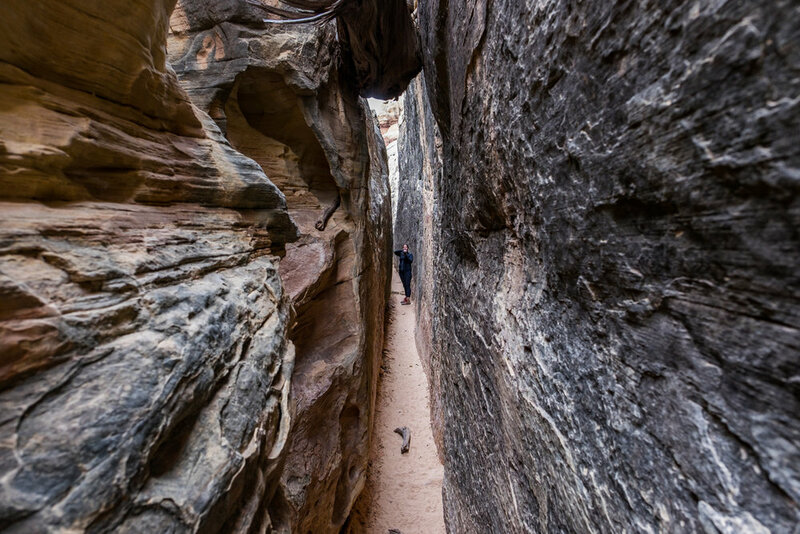 The Maze is the Wild West of the park – remote, rugged, and open to those who are eager and equipped to experience the Utah backcountry without signs and/or other visitors leading the way. In the Maze, you are left with the proverbial horse you rode in on, a map, your best-charted plans, your instincts to guide you, as well as the company you keep. Also well worth visiting in Canyonlands are the environments surrounding the Green and Colorado Rivers that trisect the Colorado Plateau; as well as the Horseshoe Canyon, where some of the most important rock art in North America resides at a site called the Great Gallery. Both areas take greater planning and commitment to get to and explore, and both deliver new unique adventures away from the fray. 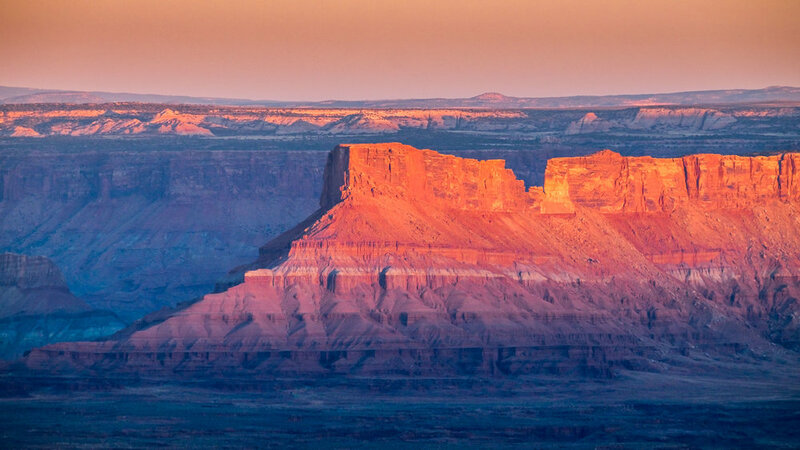 As you can see in that basic outline of the Canyonlands wilderness, there are endless things to do and see while hiking, camping, off-roading, exploring the waterways, taking photographs, and blazing your own path in this famous and also challenging park. With a set amount of time in Canyonlands, we weren't able to brave every adventure we wanted to, but we were able to do a whole lot. We've outlined below 5 sublime sites in the park – places and experiences that were truly memorable to us and reasons why we believe all should put this park (and entire region) on the short list! Mesa Arch is among nature’s great masterpieces – it is one of those jaw-on-the-ground places that you can’t believe is real until you see it glow by the light of the early morning sun. Every day at dawn, photographers and lookers-on gather to watch the sun illuminate Mesa Arch as it punctuates the keyhole view onto the valley below. The hike in is short, just .5-miles, and the scene delivers in spades. Mesa Arch is one of the great sunrise spots in all of the national parks! We include this landmark with some hesitation as it is so fragile and wonderful that we don’t want to exploit it to over-visitation. This is a somewhat secret spot in Canyonlands – if you ask the rangers about it specifically at the visitor center they will guide you, but it is not included in park literature in an effort to mitigate damage that has, in the past, been caused by careless visitors. There are no marked trails in a traditional sense, just cairns guiding the way to the overlook. 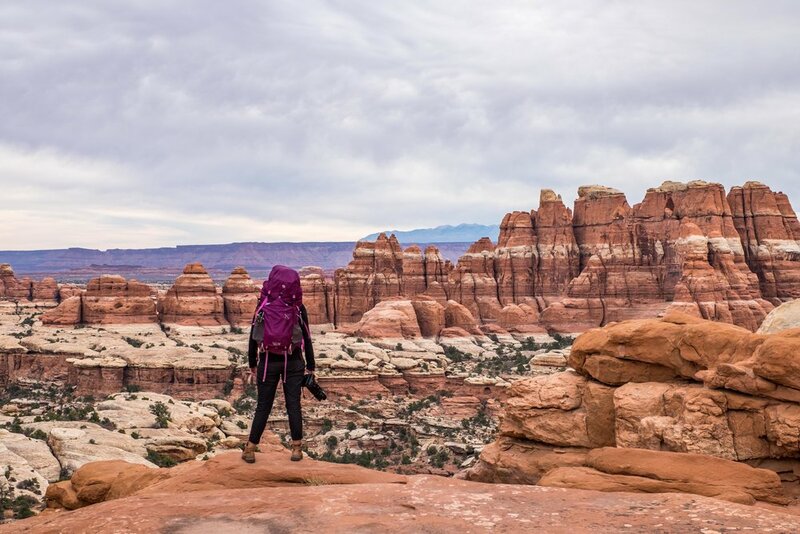 The hike gifts outstanding views of the Canyonlands the entire way, and the kiva is nestled inside a canyon cliff overlooking the geologic masterpiece that Canyonlands is. A "kiva" is a manmade structure used for communal and ceremonial purposes – a common site in ancestral Puebloan cliff dwellings (we saw a lot of "true" kivas in Mesa Verde National Park); the "False Kiva" at Canyonlands was constructed much later. — Derek, 9/10/16, Cedar Hills, Utah | Found in the trail registry at False Kiva and it is just too good not to share! False Kiva is a close hold spot in the park because of its fragile nature and historical value. 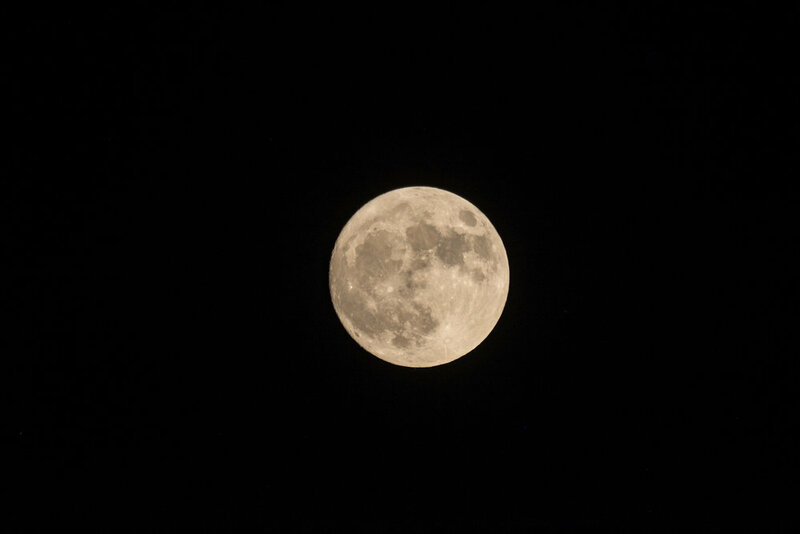 Look at how beautiful it is! Taking in impeccable views and sunset skies at our campsite in the Chesler Park area of the Needles District. The Joint Trail is a popular stop on the Chesler Loop Trail, breaking up the open landscape with a passage into the heart of the canyons. There is something magical and humbling about exploring a slot canyon – hidden from view, so close to the canyon walls, you are becoming part of the ancient landscape and are virtually hidden from the world. There are no driving roads to the Joint Trail, to get there you will need to commit to a full day hike – one that is worth every sweaty step! Wandering through the Joint Trail in the Needles section of the park. The Newspaper Rock Petroglyphs in the remote Needles section of the park are easy to access on your way in. Having the ability to walk up to and stand face to face with remnants of ancient peoples who lived so long ago in areas that are now our national parks is a grand reminder of the history of the precious American wilderness and its long and important connection with humanity. Petroglyphs at Newspaper Rock in the Needles District. How the park got its name: Citing From Controversy to Compromise to Cooperation: The Administrative History of Canyonlands National Park, by Samuel J. Schmieding, explorer John Wesley Powell designated the region "The Cañon Lands of Utah" in a 1878 report written for the U.S. government. The word cañon was anglicized in the early 20th century, and in 1963 the National Park Service merged them into one—Canyonlands! Iconic Site in the Park: In the Island of the Sky district is Mesa Arch, the most iconic landmark in Canyonlands and among the most photographed landmarks in all of the national parks. When you spend a sunrise there you will see why. 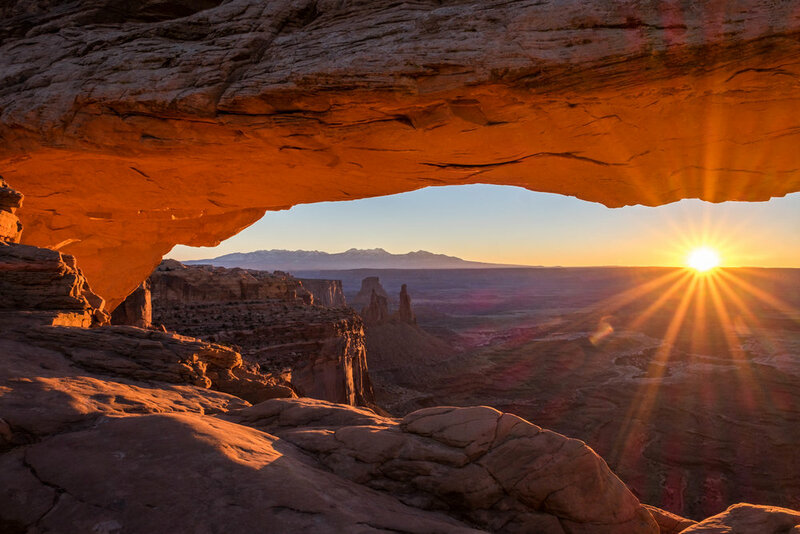 The pothole arch frames Utah’s White Rim country and the La Sal Mountains – a vista view that is alone magnificent – and that is before the first ray of sunlight pops over the horizon. When that first light bounces off of the rock beneath the arch casting an epic glow onto the roof of it framing a keyhole view of the valley with illuminated light, it’s magic! Every morning, photographers shlep their gear along the .5-mile trail to the 1,200-foot-high cliff-side to watch the scene unfold, each vying for their own take of the classic shot. Not big into photography? Have no fear – this landmark is a must-see for any visitor to the park, just know that it is only at sunrise when you will see this magnificent light show. Mesa Arch – it literally glows at sunrise. Accessible adventure: One of the engineering marvels in the U.S. National Parks are the roads that were constructed, both recently and long ago, to enable visitors to experience America’s most special wilderness places. 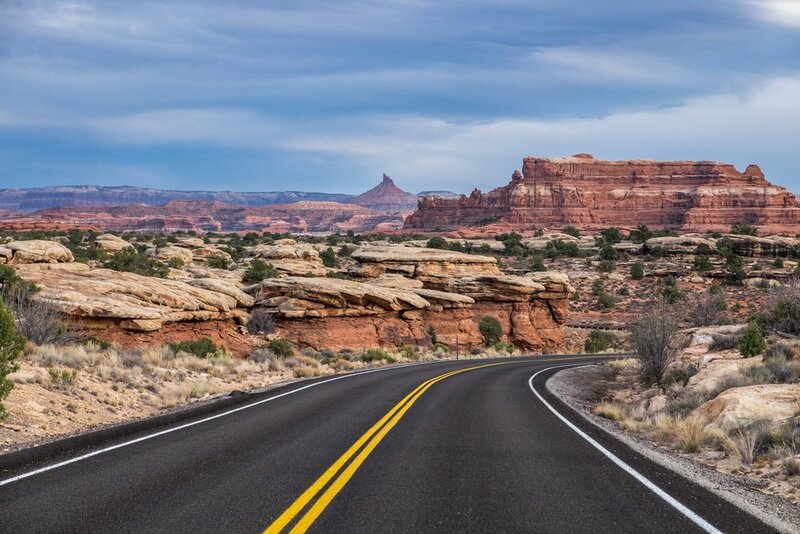 The Island in the Sky paved scenic driving road is the easiest way to explore Canyonlands National Park in a short amount of time. It is the only paved road in this area of the park, winding for 34 miles along the high mesa with panoramic views of the red rock wonderland stretching from the canyon bottom 1,000 feet below. The star of the show is at the end of the loop at the Grand View Point, the highest point on the mesa, and a scene that is considered by many to be the best view found anywhere in the park. Factor in time for other stops as there is plenty to see and do, including hiking trails that lead off from trailheads found on the side of the road and unexpected opportunities for wildlife sightings. The paved park loop road in the Island of the Sky district provides easy passage into this popular area of the park. From the Grand View Point, you can see the depth and breadth of the canyon ecosystem. 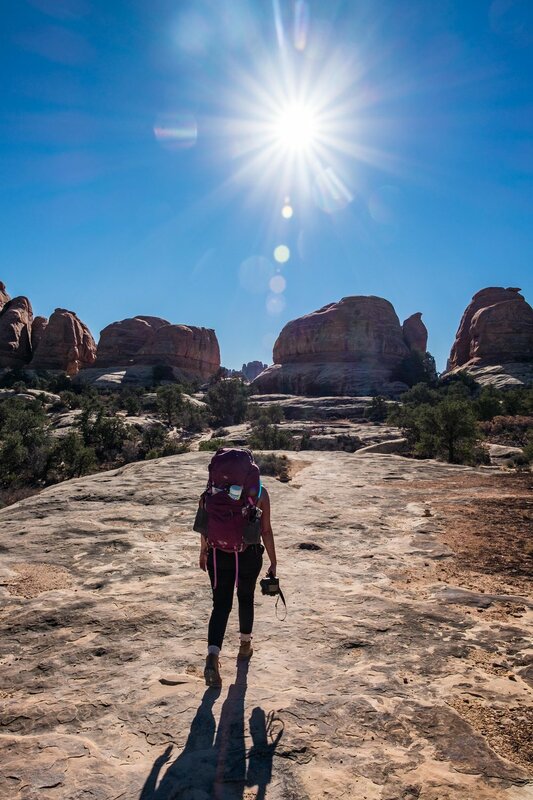 Big adventure: The 10.5-mile Chesler Park loop trail to the Joint Trail in the Needles district is as brutal as it is beautiful, asking its visitors to work for every inch of mile crossed while traveling through terrain that is seemingly never on flat ground. Your hike through rocky canyons will ensure route-finding the entire way until you reach the flat-trail Chesler Park area where rock formations rise from a grassland valley in a paradise that seems as if it is a painted illustration from a fairytale story. 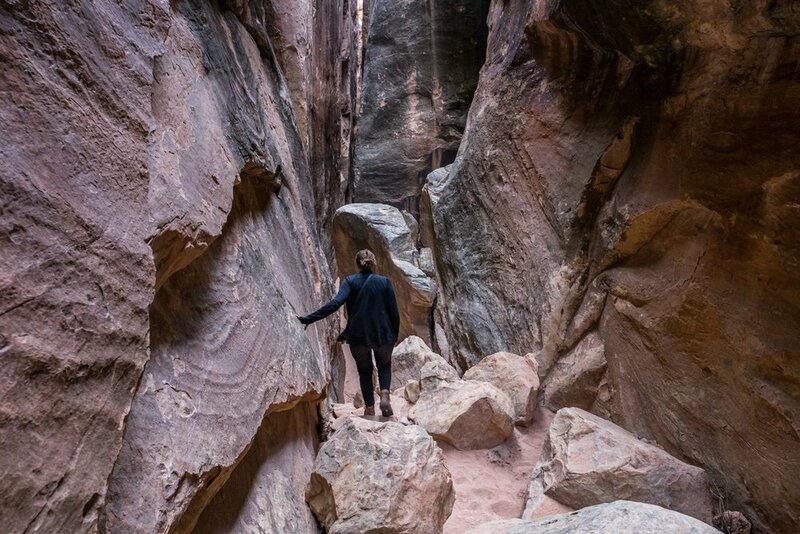 At the apex of the hike is the Joint Trail, a deep and narrow slot canyon maze network where you will rub shoulders with massive canyon walls. 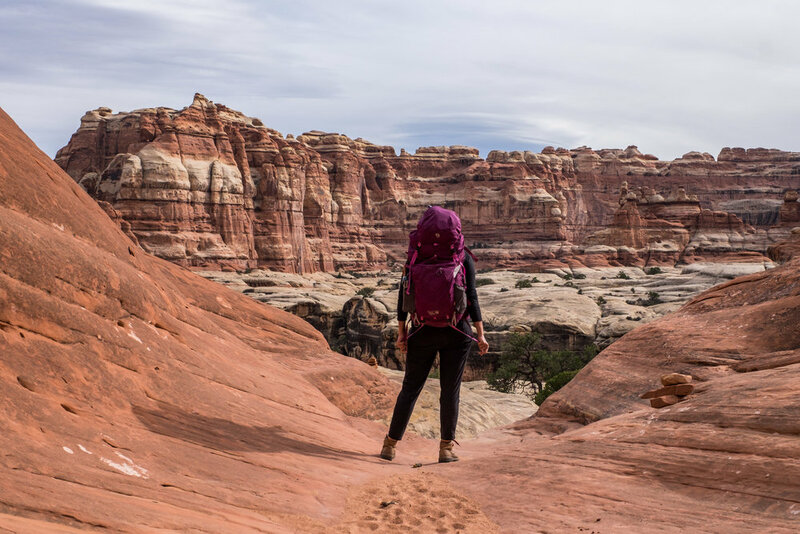 Our recommendation for this hike is to break it up by camping in backcountry at Chesler Park, where you can unwind from your day trip with canyon views in all directions while enjoying solitude beneath the stars in one of Utah's 9 designated International Dark Sky Parks. There is a vast network of trails in the Chesler Park area. Getting there takes some muscle and it is 100% worth the exertion. CP1 (Chesler Park 1) is among our favorite campsites of the year, with stunning views in all directions that are completely unique to one another. 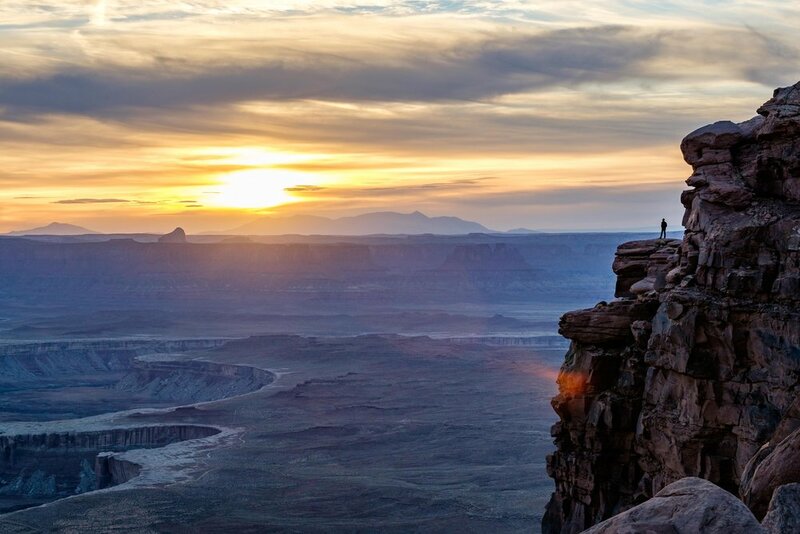 Canyonlands was the 31st national park and was established by President Lyndon B. Johnson. 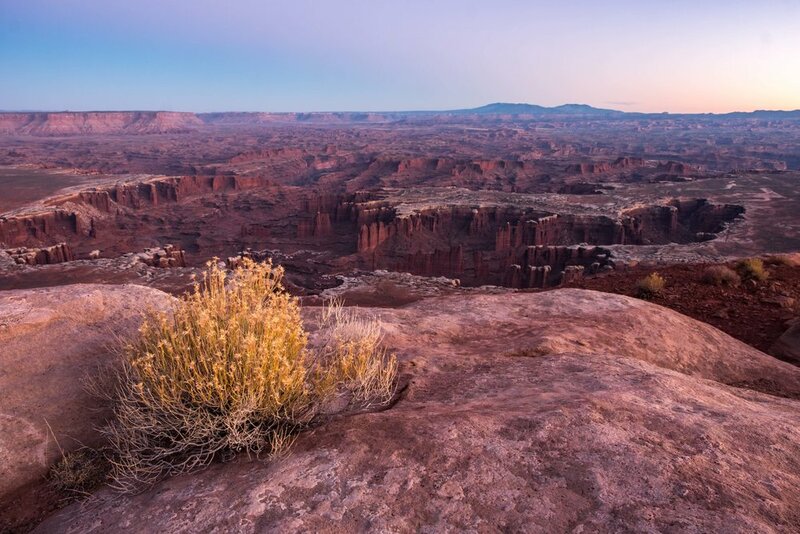 An early proposal of protection for Canyonlands suggested that the size of the park should exceed one million acres. Capturing the sunset with the rock solid Fujifilm X-T1. Canyonlands is less popular in terms of visitation than its nearby neighbor, Arches National Park, but it is just as treasured by landscape photographers who come to the area seeking epic shots of the American Southwest. 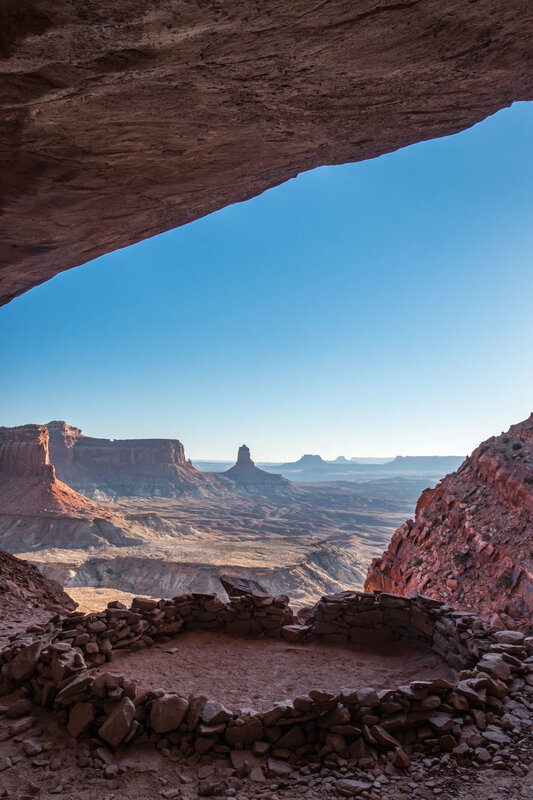 With a connected ecosystem, Canyonlands shares many similarities with its sister park, Arches, which is located just 26 miles down the road. Both are covered with bio-organic cryptobiotic crust; both have natural occurring “pothole” depressions that collect water for animals (and sometimes people) to drink from; and both have spectacular arch formations that have been formed over the course of millions of years. There are two types of rock art, both are found in Canyonlands. Pictographs are paintings of more than one color decorated onto sandstone surfaces. Petroglyphs are images that are pecked, ground, and chiseled onto the surface of rock. The Horseshoe Canyon unit is known for its large collection of historically significant rock art. To see artifacts dating back as early as 9000-7000 BC, make way to the Great Gallery where an ancient cultural history of the area is memorialized on stone surfaces. 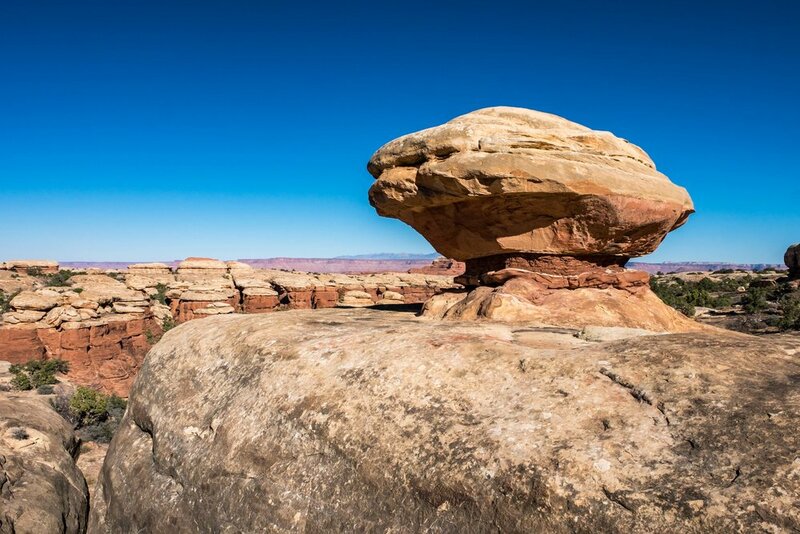 Geologic wonders abound in Canyonlands. Sandstone formations seen at Canyonlands are made of salt deposits that were layered hundreds of millions of years ago beneath the Earth. The deposits are forced from the ground due to the enormous pressure of surface rock, resulting in the marvelous formations that cover the national parks in southern Utah. Cataract Canyon, one of the world’s most actively filling canyons, is a popular area on the Colorado River to raft the whitewater. The first recorded expedition there was in 1869 on the John Wesley Powell Expedition – their vessels made of wood. As you may have heard or read in the news, there is a large and ongoing dispute between the Federal and state government in Utah over who should manage the large portfolio of protected lands that resides in the state, including Canyonlands, Arches, Capitol Reef, Bryce, and Zion National Parks. There is much to read up on regarding this topic, here’s an article to start making a strong case of why ‘Public Lands Belong in Federal Hands’ from Outside Online. Golden hour in the Canyonlands! There are only two designated campgrounds in Canyonlands, one in the Needles area and one in Island in the Sky—neither accommodate RVs/travel trailers. We recommend camping in backcountry if possible! 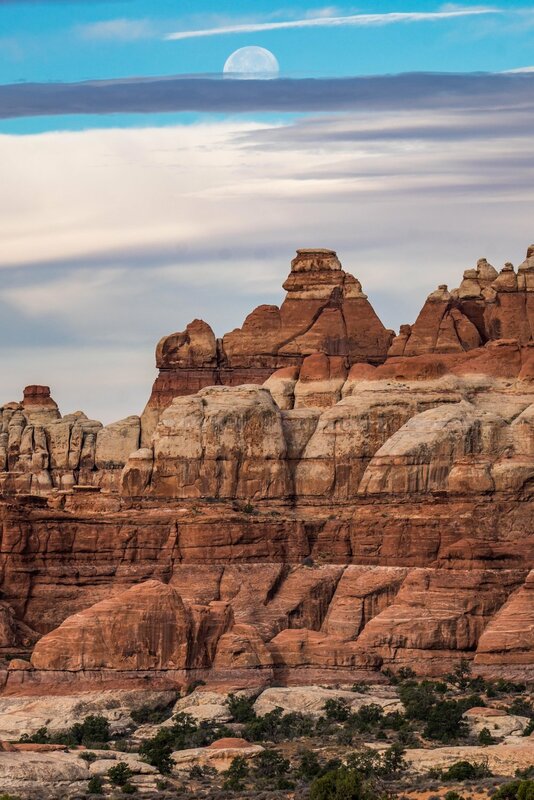 If you want to set out on a multi-day adventure, plan a biking or four-wheeling excursion on the 100-mile White Rim Road which loops beneath the mesa in the Island in the Sky area, allowing you to take in the scenery from inside of the canyons. Either mode of transport guarantees that you will be out there for at least 2/3/4 days so grab a wilderness permit and turn it into a camping trip. A 4-wheel-drive vehicle will enable you to explore more areas of Canyonlands. Tight spaces inside of those slot canyons... bring a friend! The movie 127 Hours was filmed in Bluejohn Canyon in Horseshoe Canyon – the real location where Aron Ralston was trapped for five days in 2003 before cutting off his own arm with a pocketknife to survive. Ralston was played by James Franco in the film. 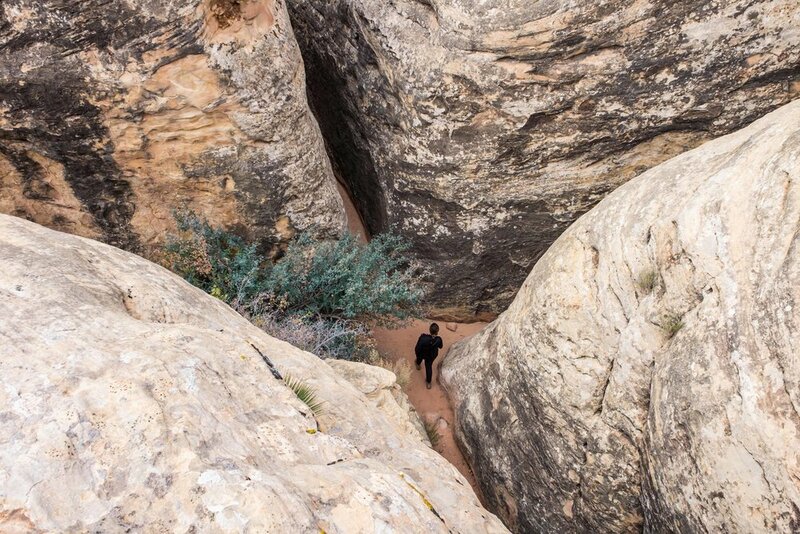 Because of its twisted labyrinth of slot canyons, what is now known as The Maze was one of the last sections of the contiguous United States to be mapped. Mapping became easier once planes were invented. Desert scenes from the film Thelma and Louise were captured in Canyonlands and Arches National Parks. In 1962, the University of Utah blocked a showing of a film describing the creation of the Canyonlands called “The Sculptured Earth"; the reason was that it was not in keeping with the teachings of the book of the Church of Latter Day Saints. The film, which was created by the National Park Service at the request of then Interior Secretary Stewart Udall, would be shown to a full house at the Hotel Utah instead, where Udall himself teed it up with with an impassioned introduction. An in-camera double exposure shot of a supermoon rising over Canyonlands in November, 2016. Canyonlands is one of nine International Dark Sky Parks in the state of Utah. Others national parks with this designation (excluding park units) include Capitol Reef and Bryce Canyon. Mesa Arch is one of the standard desktop backgrounds on Windows 7 machine. There is a ton of wildlife in this park including elk, black bear, coyote, fox, bobcat, skunk, pronghorn antelope and cougars. 237 bird species have been recorded, including golden and bald eagles, peregrine falcon, raven, blackbird, warblers and hummingbirds. The park service has wildlife cameras fixed inside of the park allowing us to check out animal activity from the comfort of our homes! During the National Park Service Centennial Year in 2016, the park recorded 776,218 visitors. 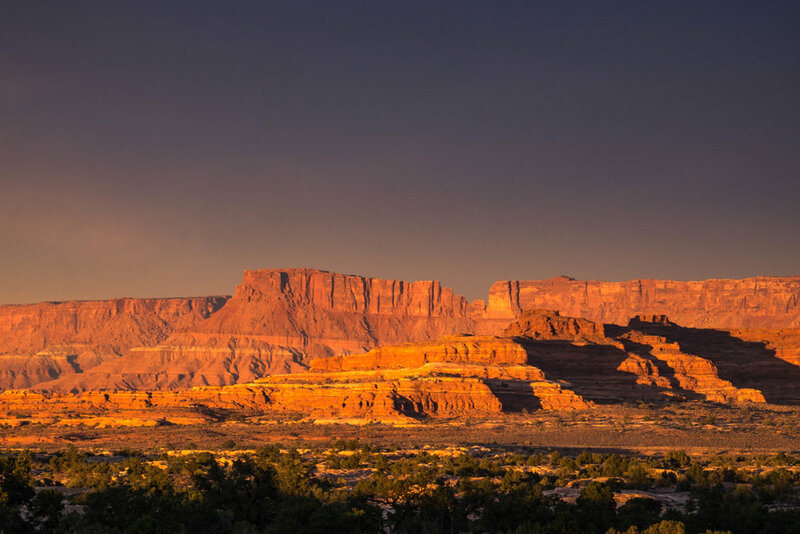 The La Sal Mountains rise behind the Canyonlands illuminated by the light of a richly colored sunset.